I went looking for a beach cat to sail at my lake cottage in northern Michigan. After a bunch of Craigslist searches and going to look at several boats, I found a sweet little Hobie 16 near Chicago. The Hobie 16 is the original beach cat, the one that started it all. Production started in 1969 and continues today. The boats are fast, fun, and pretty tough; the perfect boat for the kids to bang around in. Our boat is was built in 1984 and has been taken care of fairly well, but it needs a bit of work. The price was right at $900. We can afford to spend several hundred dollars on refit items and will still end up with a solid, fast boat at a decent price. Used Hobies are such great deals that we can spend a few times what we paid and still spend a fraction of the new price of a smaller dinghy. The Hobie 16 is all about the sails, so we started out by talking to our sailmaker Peter Grimm of Super Sails in Fort Lauderdale. There were several options, including 3.9-ounce Dacron for recreational use or 6-ounce Dacron for a beach sail. 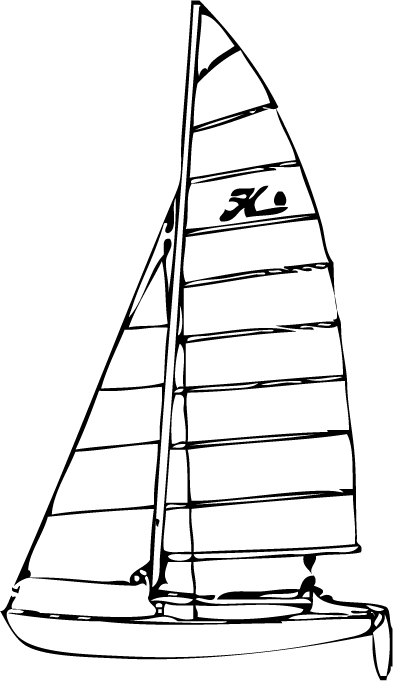 Other custom laminated sails are available for people looking for maximum performance. The 3.9-ounce sail is the most commonly available and is offered in a rainbow of colors. They are made in crosscut layout with the standard Hobie 16 sail battens, which helps keep the sail cost down as most people have their existing battens and they are usually in good shape. The 3.9-ounce main starts at $544 and the jib at $274. The most common reason people need new Hobie sails is that they leave them out in the sun and the UV rays destroy the cloth. This is the reason some sailors choose the 6-ounce Dacron sail. These sails are by far the most durable sails available, popular for resorts and people who tend to leave their sails out when not in use. The 6-ounce sail has thicker woven fibers that allows the sails to stand up to the sun longer. They are more durable but they are restricted to only red, blue and yellow material. We plan to leave our boat outside, but UV is not that big of a deal in northern Michigan, so we decided to go with standard 3.9-ounce sail and worked out a cool color scheme for our boat. The total cost for our two sails was $818. Our mainsheet was pretty dirty so we decided to replace it. The mainsheet is a critical control on a cat, so we opted for a new kink-free line. We chose Rooster Sailing's Polilite from Annapolis Performance Sailing in 3/8-inch diameter. Polilite is designed not to kink; in other ropes the cover can rotate around the core causing tangles as the core tightens under load. Polilite eliminates this by weaving a tight polyester cover over a polypropylene core. The polypro is very light and will not absorb water. We should be able to safely and easily ease out our sail without worrying about tangles. We paid $65 for 44 feet of 3/8-inch rope. The trampoline on our boat had a little rip in one corner so we decided to break the bank and get a new one. We found a new aftermarket mesh tramp for just $325 with a lacing kit from Annapolis Performance Sailing. The tramp was easy to install and looks a lot better than the old one. The kids were pretty excited about the boat and couldn't wait to get out sailing. After I thought about it a bit I decided to add a masthead float. A catamaran is just as stable inverted as it is upright, if it turns turtle it can be very difficult to right and the rig can be damaged if it hits the bottom. Hobie sells a great kit that includes the float and all the mounting hardware. The float adds 59 pounds of flotation to the masthead. The whole thing can be easily removed for racing or trailering. It cost us $240 dollars, but adds a lot of peace of mind when the kids take the boat out. We are going to sail our boat on a small inland lake, our racing will be limited to other boats-any boats-on our lake. If we were going to one-design race the boat, we'd need to find class legal sails and a trampoline that would come at a higher cost. Before we launched the boat we washed it and put on a couple coats of 3M Scotchbrite Marine Liquid Wax. This wax works great; it cleans nicely, leaves a long-lasting slippery finish, and is really easy to use. A bottle cost us $24 at our local West Marine. We spent a small fortune compared to what we paid for our boat, but we have a great little cat for just under $2,350.